In March 1988, in preparation for the Beatification of Father Charles, his remains were exhumed for a second time. At this time the remains were interred in the shrine within the Church of St. Paul of the Cross. When the coffin was opened the remains were removed to a safe place and the bones allowed to dry out. 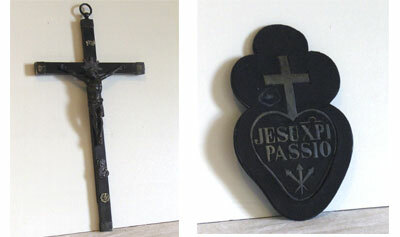 The Passionists Mission Crucifix and Passionist Sign interred with the remains were removed and replaced. This are pictured above and are now in the Saint Charles Exhibition in Mount Argus Church. Also removed and replaced at this time were the Passionist Habit in which the remains were clothed and the metal Crucifix from the lid of the coffin. Both are pictured below and are now in the Saint Charles Exhibition in Mount Argus Church. The remains of Father Charles were re-interred in a newly designed shrine in Mount Argus Church.